Our bodies were not made for the constant barrage of today’s synthetic pharmaceutical drugs, pesticides, processed foods, artificial preservatives, and environmental pollutants that continually throw our bodies out of balance. 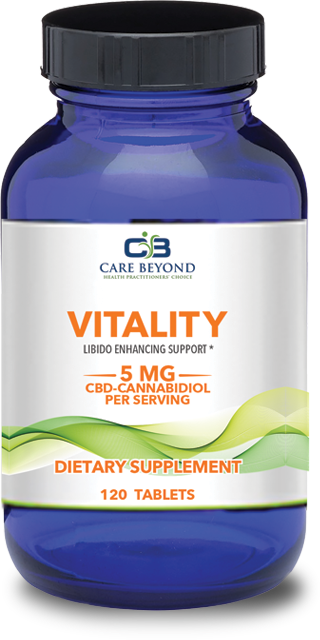 Care Beyond has developed all natural CBD enhanced products that balance our bodies to meet today’s high-stress demands desperately needed for our bodies to function at optimum levels. What separates Care Beyond from the competition? Watch Dr. C. Yvette Oliver talk about the difference of Care Beyond and how CBD can positively affect your life. Ingredients: Herbal Extract Blend: Blueberry (Fruit) Powder, Cannabidiol (CBD) Isolate (From hemp oil seeds and stalks) 15 MG, Black Currant (Fruit) Powder, Reishi Mushroom Powder, Shiitake Mushroom Powder. Other Ingredients: Virgin Cold Pressed Olive Oil, Natural Pineapple Mango Coconut Flavor, Mineral Silica, Monk Fruit Extract, Vitamin E (stabilizer). 60 mg), Hemp Oil (Seeds and Stalks) Extract (Cannabidiol (CBD) 5 mg), Black Pepper (Fruit) Extract (95% Piperine). Other Ingredients: Dicalcium Phosphate, Microcrystalline Cellulose, Stearic Acid, Croscarmellose Sodium, Vegetable Stearate, and Mineral Silica. Herbal extract blend: Ashwagandha (root) Extract (8% Withanolides), 5-HTP (from Griffonia Simplicifolia Seed Extract), L-Theanine, Hemp Oil (Seeds and Stalks) Extract (Cannabidiol (CBD) 25 mg), Black Pepper (Fruit) Extract (95% Piperine). Other Ingredients: Microcrystalline Cellulose, Hydroxypropyl Methylcellulose, Vegetable Stearate, and Mineral Silica. Ingredients: Herbal extract blend: Blueberry (Fruit) Powder, Hemp Oil (Seeds and Stalks) Extract (Cannabidiol (CBD) 25 mg), Andrographis Extract, Tart Cherry (Fruit) Powder Extract, Cranberry (Fruit) Powder Extract. Other Ingredients: Manitol, Xylitol, Microcrystalline Cellulose, Crospovidone, Dicalcium Phosphate, Natural Wildberry Flavor, Crosscarmellose Sodium, Vegetable Stearate, and Mineral Silica. Immunity combines CBD, herbs and vitamin C to protect and boost your immune system. It’s unique properties may help in staying healthy and active*. Care Beyond has developed a product line of all natural CBD enhanced products to meet today's high-stress demands on our bodies. Cannabidiol, or CBD, is a compound found among the 80 individual compounds in the cannabis (hemp) plant. CBD belongs to a class of molecules called cannabinoids, known to have enormous health-promoting benefits. CBD works in an important part of your body in what is called the endocannabinoid system (ECS). The ECS works in tandem with your immune system as well as many other of your body’s systems to keep you healthy and balanced. The ECS and their receptors are found everywhere throughout the body: in the brain, organs, connective tissues, glands, and immune cells. Endocannabinoids are chemical messengers working in the ECS throughout your body to regulate day-to-day bodily functions. The most remarkable thing about CBD is the sheer number and variety of its potential therapeutic benefits. Cannabinoids, interact with your native ECS. Everyday stress, worries, aches and pains combined throw our bodies off balance. This central system’s role is the maintenance of the body’s homeostasis, which maintains equilibrium despite outside influences or fluctuations. Your ECS works to keep that from happening and CBD’s are the key to nourishing and maintaining that very balance.